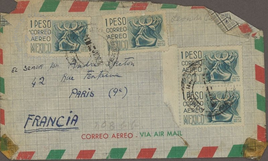 Letter sent by Leonora Carrington to André Breton from Mexico. Typed letter signed by Leonora Carrington to André Breton and typescripts. - One page in-4°, typed letter signed by Leonora Carrington to André Breton, with a signed typewritten text titled “L’Homme neutre”. A typewritten poem by Gogo Nesbit is also enclosed. - “L’Homme neutre”. Typescript annotated with spelling corrections by André Breton in black ink and with further handwriting in blue ink. Titled, signed, undated.